The People's Republic of Chukotka is a nation in the far northeastern end of Asia. It has been ruled, at various times in the first half of the 20th century, by Russia, Japan, China, and by two now-extinct nations, the Soviet Socialist Republic of Siberia and the Imperial Soviet Republic of North Manchuria. The People's Republic of Chukotka is a Trotskyist Communist state. The supreme executive authority is the First Comrade. Legislative authority is invested in a Supreme Soviet of the People's Republic, which consists of representatives elected by regional Soviets, which are in turn made up of representatives elected by local Soviets. The Supreme Soviet elects the First Comrade, and may remove him upon a Vote of No Confidence. Government tends to be fairly decentralized, though the Supreme Soviet has grown in power since the mid-70's. Chukotka is a multi-party system, dominated by the Socialist-Democratic Party and the Socialist-Revolutionary Party. The state continues to give lip service to the concept of World Revolution. However, in reality, it tends to largely keep to itself, trading with capitalist nations, and maintaining friendly military relations with Japan. The area's modern history begins when Russia, expanding eastwards, incorporated the area in the 17th century, and crossed over the Bering straits to Alyaska, Oregon, and Roshiya. 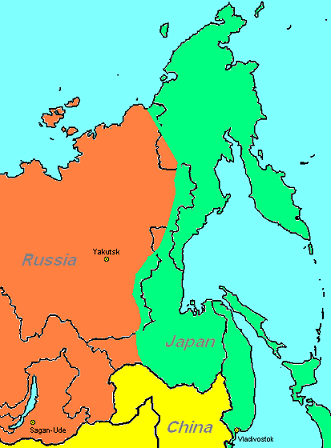 The area became ruled by the Empire of Japan after the First Russo-Japanese War (1903-1905). 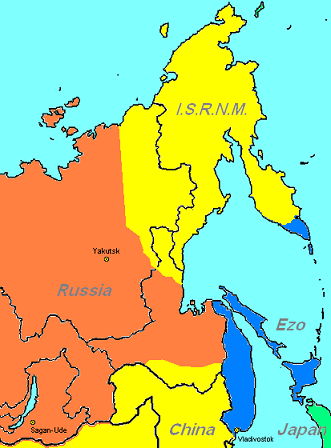 This area (with the exception of Gaimanxù/East Primorye, Alyaska, and the Kamchatka Penninsula) soon returned to Russian rule in the Second Russo-Japanese War (1910-1911). Shortly afterwards came the brief Socialist period of Russian history. After the White Armies (who would later become SNOR) overthrew the Bolshevik government, the former leaders fled to the east where they set up the Soviet Socialist Republic of Siberia with Japanese help (as the Japanese felt that a communist Russia would be less of a threat territory-wise than an Imperialist Russia, plus, the Socialists were a major party at the time)). Both this government and the SNORist government in Moscow claimed legitimacy over the whole of Russia, and were in a continuous state of warfare, with the Bolsheviks slowly losing ground. Sometime around 1924, the SNORists and the Chinese signed a secret agreement wherein the Chinese would aid the Russian government in destroying the SSRS (in exchange for which Russia would retrocede territory gained in the 19th century). The Chinese set up a provincial government called Northern Manchuria in the occupied area. The Russians demand the return of the Russian Far East, and the Chinese continue to refuse. This led, in 1934, to the Sino-Russian War, which lasted until Germany mediated a ceasefire. Both sides acknowledged the status quo. With much of the former Northern Manchuria province now cut off from the Chinese motherland, the Chinese, partially for propogandistic reasons, put former leaders of the SSRS, who were, at the time, in Chinese prisons, in charge of the new Imperial Soviet Republic of Northern Manchuria. Russia's zone of control now extends, once more, to the Sea of Okhotsk. This allows them to set up the Republic of Ezo in northern Japan in 1942. For much of the Great Oriental War, Russia remained neutral, being busy with the Second Great War in Europe. Near the tailend, Russia went to war with China to drive them out of the rest of their territory, and pushing into Mongolia and Uyguristan (which became SNORist satellites). The ISRNM broke off its connection with China around this time, renaming itself the People's Republic of Chukotka. It negotiated a peace treaty with Russia shortly afterwards. Russia agreed in the expectation that it would only be a temporary concession, and that Chukotka (and also Alyaska and the territories still occupied by Japan) would be reconquered as soon as Russia was finished with its war against China and Germany. However, Chukotka soon signed military agreements with nations such as Japan, Australasia, Alyaska, and the North American League, none of whom wanted Russia to re-expand eastward. 1905. 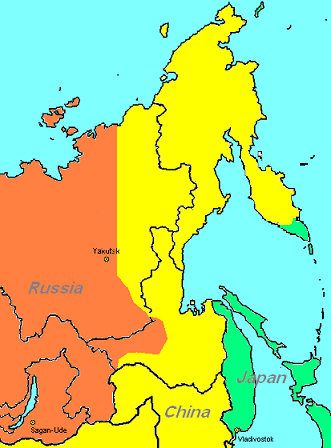 Shortly after the Russo-Japanese war (1903-1905), Japan occupies part of Russian East Asia (the contemporary borders are in black). 1920. 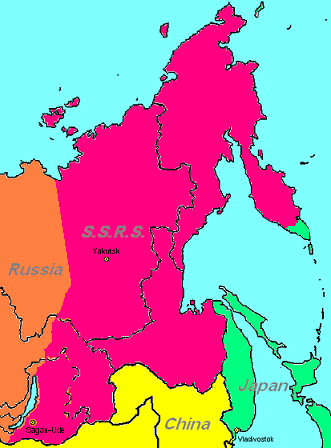 In the second Russo-Japanese war (1910-1911), Russia has reconquered most of the territories lost to Japan; only Alyaska, East Primorye (Soccaitxi), Sakhalin and the far South of Kamchatka remain in Japanese hands. However, in October 1917 the Bolsheviks took over in Moscow, and after their ultimate defeat, they were forced to move East, where they founded the Socialist Soviet Republic of Siberia (or, the Soviet Republic of the Far East). 1925. After an ongoing war between the Russian Empire and the SSRS, Russia finally makes a deal with China. After a Chinese stab in the back, the SSRS is quickly overrun and divided between Russia and China. 1942. In the Russo-Chinese war (1934-1938), Russia has reconquered huge territories from China. In 1938, Russia and China conclude a ceasefire, and the status quo is made official in a non-aggression treaty. Because the Chinese occupation zone is now effectively cut off from the motherland (and for propagandistic reasons), China puts some former SSRS leaders in charge of the "Imperial Soviet Republic of Northern Manchuria". 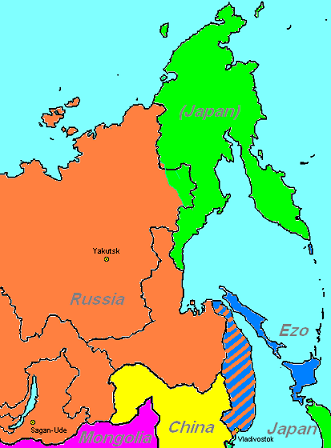 In Japan, the Republic of Ezo has been founded with Russian help and with China's silent agreement. 1949. Japan has (from Alyaska) reoccupied Chukotka (note: obsoleted; the ISRNM simply became Chukotka with no Alyaskan/Japanese rule). Gaimanxù (East Primorye) has become a Russian-Ezoan condominium, and Ezo itself a snorist puppet state. Mongolia has a snorist regime, too. South: Sea of Okhotsk, Bering Sea. East: Bering Strait (Separating the country from Alyaska). Chukotka, reflective of its various rulers, has seen several currencies. The first was the Russian Ruble. This was replaced by the Japanese lò during Japanese administration, and then back to the Ruble during Russian and SSRS rule. When the Chinese captured the territory, the Chinese yuan became the nation's currency. After the fall of China and the establishment of the PRC, the yuan was renamed the ruble. The early People's Republic lacked silver reserves, and the ruble fell dramatically. In the early 50's, as the economy developed, the government began minting coins to the old yuan standard. The yuan was valued at 60 of the then-current rubles. The yuan has since fallen somewhat since then, to approximately a quarter of its original value (specifically, the yuan is currently minted at 45 to the pound of fine silver). The official language of Chukotka is Pidgin Mandarin, written in Roman letters. In the early days, Russian served as an official language along with Mandarin, but it was abandoned early on, as the fear of Russian conquest grew. Along with Mandarin, Yakut and Chukot are important languages. This page was last modified on 26 August 2007, at 09:27.